An inherited disorder caused by a lack of an enzyme necessary to convert the amino acid, phenylalanine, into another amino acid, tyrosine, so that excesses can be eliminated from the body. A buildup of excess phenylalanine in the blood can lead to neurological disturbances and mental retardation. 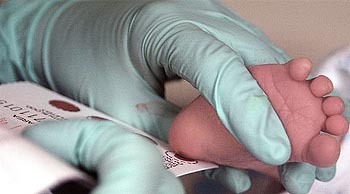 for a Phenylketonuria, or PKU, screening.